UNITED NATIONS, June 12 -- In a "Dear Colleagues" message sent out late Tuesday by Secretary-General Ban Ki-moon, UN staff were warned against sharing "sensitive communications" with reporters. "I cannot overstate how seriously I take this issue," wrote Mr. Ban, who campaigned for the UN's top post on a platform of transparency. "I am asking all Departments, Offices, Funds and Programs to review and tighten their systems and ensure that sensitive communications are well secured." Inner City Press assumes that Mr. Ban's memo, which many call ill-considered, was triggered by the leak of the Alvaro de Soto "End of Mission" report, now available in pdf format, here. But several of the UN staff who brought what they called the "gag-order" message to the attention of Inner City Press opined that Mr. Ban's reference to recent "disclosures of confidential documents to the media" was to this publication's reporting thirteen days ago about on a UN Department of Political Affairs memorandum recommending greater UN involvement in North Korea. "While U.S. concerns over UNDP financial transactions, and other alleged irregularities in the DPRK, should be met through the coming external audit and the necessary corrective action resulting from it, it is the Board's decision to cancel the economic management part of the country program, at Japan's insistence, that represents the biggest challenge." This prediction that concerns about financial and other irregularities would be met by the audit was, in fact, self-fulfilling, although it is still in-play. On June 4, Inner City Press placed the DPA report online, here, and is now told that this unmediated information-dissemination, one of the sine qua nons of journalism, is being arbitrarily critiqued by some within Team Ban, who previously sought the withholding then un-reporting of even the names of UN staff members. These UN staff members, who have requested anonymity in light not least of such critiques and of the tone of Mr. Ban's June 12 message, said that the issues that seem to trigger the most concern and circling-of-the-wagons within the Ban administration are the import of staff and advisors from South Korea and issues concerning North Korea, like the Department of Political Affairs memo and the current scandals centered on the UN Development Program. Inner City Press, on the other hand, has pointed them to, and notes, the de Soto report, now available in pdf format, here. Mr. Ban's June 12 message begins, "There are recently been some disclosures of confidential documents to the media. I find this deeply troubling and regrettable." It is noted that this reaction was not deployed in the face of earlier leaks, for example of Office of Internal Oversight Services audit reports of the UN Pension Fund and investigations into alleged abuses in UN peacekeeping missions, or of a report of the UN's Sudan sanctions committee concerning the presence in Darfur of a white plane with "UN" markings on its wings. That leaked report was put online by the New York Times in its entirety, with no similar reaction from the UN Secretariat. In this case, Mr. Ban writes that "the work of the UN to resolve conflicts and address crises around the world depends on mutual trust and discretion. Member States much be confident that we respect confidentiality whenever necessary." Following its reporting on the DPA memo, Inner City Press was told that it caused surprise and concern in diplomatic circles in Tokyo, Washington, and even in Seoul. Apparently, these governments had not known that such options-weighing was taking place. The problem, some say, is not with the leak but with a lack of consultations. Earlier this week, Chinese Ambassador Wang Guangya said of Mr. Ban, in a related context, that "he didn't expect that this process needs more time.... In this Organization, there are some rules you cannot bypass." News analysis: One of the de facto rules in the UN Organization, like nearly all other organizations, is that a free press will ferret out policy-related information, whether in final or draft form, and disseminate it to the public. Leaks take place in nearly all governments -- North Korea, like Turkmenistan, might be an exception -- and in all inter-governmental bodies. A ham-handed insistence on stopping all leaks, and by implication on punishing all leakers, is hardly indicative of taking the high road, or of transparency. Whether Mr. Ban is being well-served by his advisors is a question one hears more and more frequently, in the press and diplomatic corps and beyond. Developing. There have recently been some disclosures of confidential documents to the media. I find this deeply troubling and regrettable. The work of the United Nations to resolve conflicts and address crises around the world depends on mutual trust and discretion. Member States must be confident that we respect confidentiality whenever necessary. I therefore take this opportunity to remind staff of their obligation to do so. I cannot overstate how seriously I take this issue. In the meantime, I am asking all Departments, Offices, Funds and Programmes to review and tighten their systems and ensure that sensitive communications are well secured. 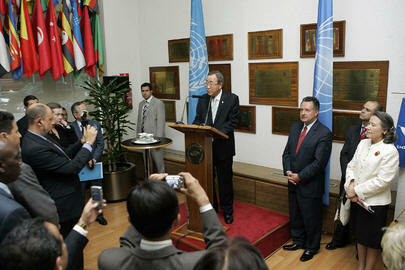 Allow me to express my warm appreciation for your dedication and professionalism in the service of our United Nations.